Interesting reading exploring insights into art, fear, creative habit, courage and trust. Thinking alot about creativity and the mystic and myths about those who display it, where it comes from and how to get it. Some interesting thoughts via Brain Pickings by John Cleese. See his insights at the video links below where he explores open and abstract verses closed and specific. He says you need: Time- Time - Space- Confidence and Humour. The reality: Research suggests that creative ability has far more to do with hard work and commitment than any natural ability; even for those people we call geniuses. Read Malcolm Gladwell's 'Outliers' and note the 10 000 hour rule. The reality: Creative people are synthesisers as much as they are originators. They bring ideas together in new ways to create something new out of existing ideas. Acknowledging influences and responding to them is not weakness, it is self-awareness. The reality: The Inspirationist view holds that creativity is divinely inspired and that creative people merely act as channels for external inspiration. This view does not give the artist much credit for creativity – but doesn’t give the creative person any responsibility either. Mental illness causes creativityThe reality: Science has found a link between mental illness and creativity in some creative industries. But that does not mean that creativity causes mental illness nor that you need to allow a mental health problem to flourish in order to be the most creative. While this myth and the previous one both stem from the belief that creativity comes from extraordinary thought processes or an altered stated of mind, current research suggests that creativity has more to do with a number of ordinary thought processes and a combination of divergent (or lateral) thinking and convergent thinking. Rather than hindering the process, structures actually enable creativity to occur. Although the two words are often used interchangeably, ‘artistic’ and ‘creative’ are not the same thing. Arenas like maths, science and engineering that aren’t traditionally associated with creativity have just as much claim to the word as those that are. Some art forms have completely exploded this myth just by the nature of the skills involved. But all creativity activity involves and relies on other people, whether that is in the manufacture of materials, those who provide advice, the foundations built by those who came before you, or those responsible for recognising products and ideas as creative. Romantic ideas of authenticity and art for arts sake have traditionally privileged intrinsic motivation over any other from of reward for artists – particularly financial. But creative people like praise, status and money as much as anyone else and many are fast tiring of the myth of intrinsic motivation being used as an excuse for undervaluing what they do financially. If we understand how creativity works, that it is the product of cultural and social forces, and that it doesn't belong to lone geniuses but to individuals who actively participate in the process, then we can replicate that process. Neurology, psychology,sociology and education are now contributing to a growing body of research about creative processes and one thing all the disciplines agree on is that understanding the creative process helps people be more creative. CreativeMornings is a monthly, free breakfast lecture series with interesting speakers and discussion. CreativeMornings/Melbourne is free of charge! "From cave paintings to the internet, or how art and cultural ideology shape one another." I'm such a fan of the blog 'Brain Pickings'... another great well researched piece on the 100 ideas that changed art by Maria Popova. This is a great 4 part online video series that is so worth listening to. Its all about appropriation and nothing is off limits. Artists take note! Need a Berlin art fix? This time last year I was immersed in a study tour in Germany with VCA students, and I desparately need another fix...so a few sites and images to re-inspire. Monocle24 is the coolest, hippest thing to come out of the UK since...ummm. Interested in what happened to all artwork looted during WW2?Recently the spotlight has fallen on the incredible and sustained effort to track and reclaim collections. 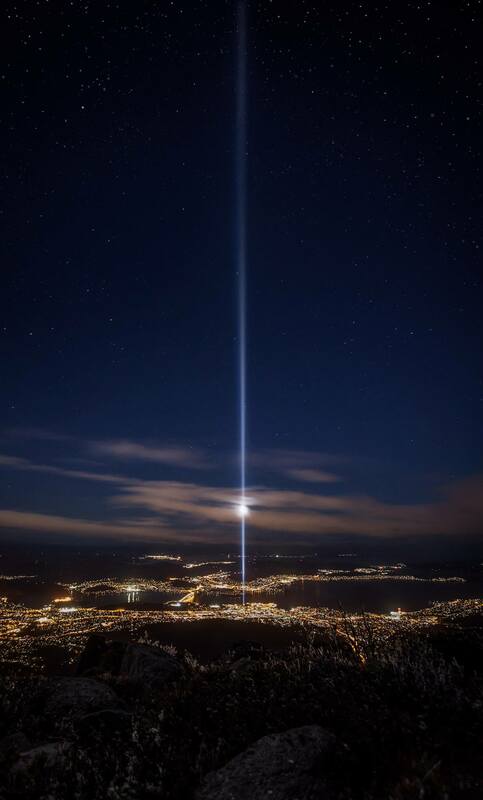 This looks like a spectacular piece at Hobart's current Dark MOFO. A large scale public piece that creates a 15km tower of light made up of 49 searchlights to break the black evening. This is Spectra, Ryoki Ikeda's installation that forms the central plank of Beam in Thine Own Eye, and the word is people seemed pulled towards it unable to resist its allure. The Helix Tree by Bruce Ramus is a grand sculpture of light and steel in the centre of Melbourne City at Fed Square. Inspired by the naturally occurring shape of the helix, the sculpture is constructed from 21 curved steel beams fitted with hundreds of LED lights. Like branches of a tree, the beams spiral 13 metres high into the sky from a central trunk. The Helix Tree uses sound-responsive technology via which voices of Melbourne bring to life its unique and vivid light displays. A series of community driven short videos to address the question "When does the light turn on'? sharing diverse views on what it means to be part of contemporary Australia.